Professional biography: B.J. 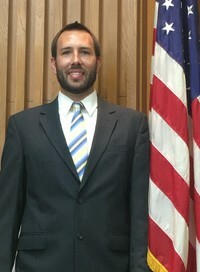 Roberson was selected to serve as a commissioner for the City of Cushing in June 2017. He is honored to be serving and representing the citizens of Cushing. He and his wife, Maria Roberson, own and operate Roberson Properties, which is a real estate investment business specializing in rental properties and property management. The company primarily operates in Payne County and Oklahoma County. Prior to real estate, B.J. worked in the entertainment industry as a booking agent and talent buyer at Box Talent Agency in Oklahoma City for over ten years. B.J. also has a background in excavation construction, which he gained while working at his father’s excavation company for eight years. Personal: B.J. was raised in Seminole, OK and graduated from Seminole High School in 1997. After high school, he attended the University of Oklahoma and studied business. B.J. and his family moved to Cushing from Oklahoma City in September 2015. He is married to Maria Roberson, who is a nurse anesthetist at Hillcrest Hospital Cushing. They have four children ages 13, 12, 7, and 5. The kids attend Cushing Public Schools and participate in various activities. B.J. and family are members of the First United Methodist Church Cushing.